In Mod of the Week, Chris LIvingston scours the world of user-created adventure for worthy downloads. 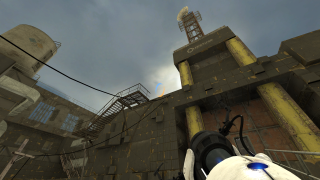 This week, a Portal 2 mod that fuels our dreams of an above-ground Aperture City. Apart from a guard booth and a small shed in a field, most of what we've seen of Aperture Science has been carefully hidden underground. Perhaps if things hadn't gone so horribly wrong in their massive subterranean lab, Aperture eventually might have built a proper above-ground campus, like Google or Microsoft. That's the premise of Above Aperture. You're on an excursion to Aperture City, a large above-ground compound littered with buildings and devious test-chambers. Above Aperture features some custom models and art, as well as a really nice piece of custom music. Not only are the maps lovely to look at, but they're pretty challenging as well. I spent a good deal of time in the very first level wondering just what the heck I was supposed to do. I could clearly see the spots I needed to get to, and I knew I had the tools to get there: my portal gun, a light bridge, and a faith plate. There were even clues in a few spots, little arrows painted on the concrete... anyway, it was a challenge, a nice twist on the standard game-play, and quite satisfying when I finally figured it out. Light bridges are a big part of most of the puzzles, but there are other familiar elements: laser-beams and mirror cubes, a bit of gel, a few turrets here and there. The chambers are nice and big, and for me, they're the best kind: where you sort of wander around for a bit before you even try anything, peering at the walls and ceiling, trying to put the solution together in your head before you actually start firing the gun. I really do like being above-ground, too. I know, it's just a skybox, and the maps may as well be underground anyway because you're trapped in them either way, but it still feels a bit more freeing being able to see the sky (though no moon, of course). It's also one step closer to my ultimate Portal dream: a huge GTA-style metropolis I can fling portals around in. Above Aperture is in three parts which you can subscribe to here. I certainly hope there will be more of this adventure to come: the puzzles are pretty fiendish and the maps are very well designed, not just in how the puzzles function but in the overall atmosphere as well. You can also check out more of the modder's Portal 2 workshop items here.